Let Mario, Wario, and Elec Man transport you to a turn-of-the-century seaside boardwalk. 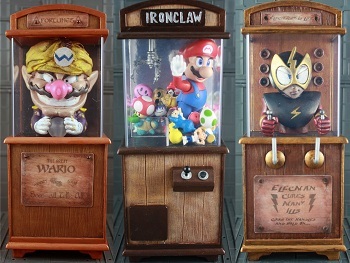 Mario, Wario, and Elec Man are no strangers to arcades, but they've never been in cabinets quite like these before. Donald Kennedy, AKA Kodykoala, has created three vintage-style arcade cabinets with these three iconic characters. Rather than side-scrolling games, these retro gems take the form of fortune-tellers, claw games, and electric jolts. Kodykoala, a self-described nerd and custom toymaker, routinely makes customized figures and statues of iconic characters like Mega Man and Donkey Kong. Recently, he tried his hand at something different: an old-school fortune teller machine (think "Zoltar Speaks" in Big) with Wario as the gypsy. The cabinet, which stands less than a foot tall, features a light-up crystal ball and a spoken phrase from Wario. A month later, Kodykoala made a companion piece for Wario: Super Mario himself stuck in a claw machine. This model didn't feature any lights or moving parts, but crammed an enormous amount of detail into a small space. The final, and most ambitious, piece in the boardwalk trilogy appeared only a few days ago. This model features Elec Man dispensing an electric shock through an arcade cabinet - an actual treatment for illnesses in the 19th century. Although Kodykoala's machine does not fire real electric bolts, he simulated the effect with LED lights and a vibrating motor. Kodykoala's efforts will not leave an indelible stamp on gaming history or excite thousands of eager fans, but it's gratifying to see how gaming can inspire someone to create high-quality pop art. Those who want to own some of the most unique gaming toys ever designed should keep an eye on Kodykoala's blog for information on how to purchase the cabinets.